In April, I wrote that wine importer / wholesaler CHEERS, which has more than a dozen shops in Beijing, would soon expand to Shanghai. The team, led by Claudia Masueger, has been on a role ever since and has now opened shops in six more cities — Chengdu, Dalian, Hangzhou, Lanzhou, Qiqihar and Shenzhen. While Masueger says the dream goal is 888 stores, reaching 50 shops over the next year is her more modest target. The company has struck a chord, especially with younger drinkers, given the shops offer a colorful and upbeat vibe (the motto is “CHEERS makes you smile” and screens show fun CHEERS TV videos), activities (including free tastings and events like comedy nights) and inexpensive wines (starting at rmb28). CHEERS is working on wine recommendations categorized by mood and occasion and on more food options, such as cheese platters, and continues to sell a small range of spirits as well as beer from Yunan operation Shangri-la Brewing. 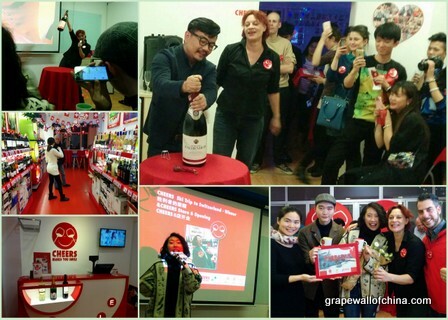 CHEERS also recently expanded its office, which includes a demo store, and marked the occasion with a party earlier this month that included giving away a trip to Switzerland, Masueger’s homeland, to the winner of the company’s photo contest. There’s a lot going on with the company, which I wrote about in early 2014 for Wine Business International — more details here — and it will be “one to watch” in 2016. Sign up below for my free China wine newsletter. Here are the Shenzhen store details! Where is the shenzhen shop?